You may have caught the KUTV 2News at 10 story "Beauty Queen Rocks Judges From Wheelchair" a few weeks ago. If not, you can watch the entire story on their website. A few months ago, Holli Hunt competed in the Utah Miss Amazing pageant. 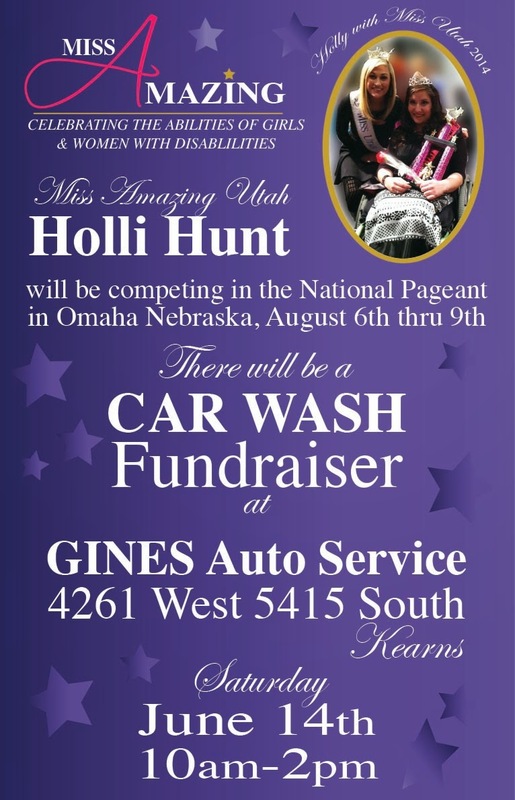 When Mark Gines, owner of Gines Auto Service, heard about the pageant, he immediately thought of Holli with her contagious smile and infectious personality, and knew she would be perfect for what the judges were looking for. The Utah Miss Amazing pageant celebrates girls and women with disabilities like Holli's. She was born with Spina Bifida and lives most of her life in her wheelchair. The mission of Miss Amazing Inc. is to provide opportunities for girls and women with disabilities to build self-confidence in a supportive environment. This summer Holli will be traveling to Omaha, Nebraska to compete in the national Miss Amazing competition, but she needs our help! Gines Auto Service will be holding a car wash fundraiser this Saturday, June 14th, from 10am to 2pm in front of their shop in Kearns. The address is 4261 W 5415 So. 100% of the proceeds will go towards Holli to fund her trip.